So I may have gone on a cracker making craze. 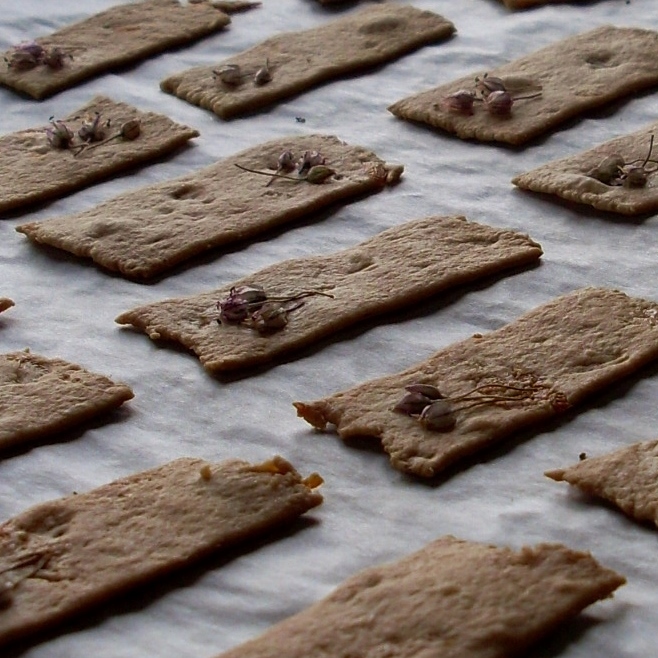 The native pepperberry and pepperberry leaf crackers I made for my friend were such a hit she wanted us to make some more. My Grandpa has garlic growing wild in his garden, so a logical flavour choice was roasted garlic. We even have some of the pretty garlic flowers in bloom that could be used as a garnish for the crackers. I slow roasted the garlic cloves in the skins in foil while the oven was on for something else. By slow I mean 150oC max, for a couple of hours. I used spelt flour in this recipe, because I had some from my visit to Callington Mill in Oatlands. I love spelt and I thought it would be good here, but you can substitute all-purpose wheat flour. 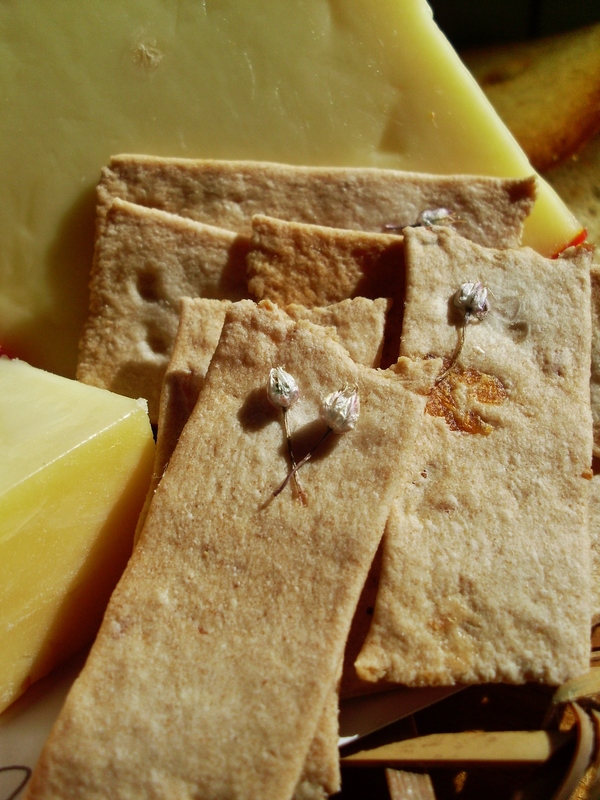 These crackers are surprisingly good as is for snacking, but they’d be great served with a roast pumpkin dip, or basil pesto. Other dips would work well too. You could serve them with a good quality cheddar, but I wouldn’t bother with any other cheeses. Combine the flour and salt. Make a well in the middle and add the oil, water and garlic. Bring the mixture together with a fork. Knead the mixture until you have a silky dough. Leave the dough to rest for at least 30 minutes. Pass the mixture through a pasta machine or roll it until it is approximately one millimetre thick. I would recommend having a strip that is 5-10 centimetres wide. Cut the rolled dough into rectangular crackers and lay them on a lined or oiled baking tray. If you are using garlic flowers, dip the tip of your finger in a little water and brush one end of the crackers before arranging a few little purple flowers on one end. Bake the dough in a preheated oven for 5-10 minutes or until just golden. Allow the crackers to cool completely. This entry was posted in In-Betweens and tagged biscuits, Tasmania. Bookmark the permalink. You’re totally crackers! Seriously, these look as good as pepperberry ones. You could go into business, or just potter, and bake and share your recipes with us! Thanks for sharing.